There are over 700 ant species in North America. Nature’s premier recyclers, they constantly mix nutrients and decaying matter into the soil to be readily broken down. They aren’t working alone, however. The small mound at the entrance of an ant colony hides a labyrinth of interconnected tunnels home to perhaps hundreds of thousands of residents. Ants are the ‘social butterflies’ of the insect world- while there are other insects that live cooperatively, it is usually very rare. Ants, as far as we know, only live socially in colonies. 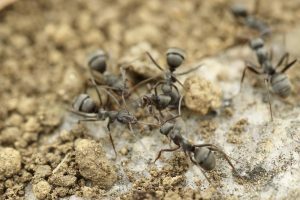 Some species have been found living together in shared colonies, and some ants have been known to form linked ‘supercolonies’ that can stretch for hundreds of miles! These industrious insects are able to survive all over the world and perform incredible tasks using very small brains. Ants are always mixing and aerating the soil, allowing water and air to penetrate to plant roots. 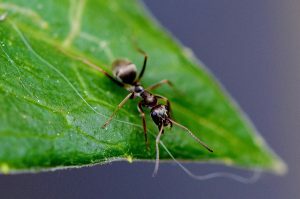 They also help disperse the seeds of around 50 percent of plants- some plants even produce structures called elaiosomes on their seeds designed to entice ants to take their seeds back to the colony. The ants eat the elaiosomes upon returning home and discard the seeds into their refuse pile, effectively planting them. Ants have been known to dabble in agriculture as well. Tropical leafcutter ants collect leaves from the surrounding forest, sending green trails all along the forest floor. These leaves aren’t for the ants to eat, however. The leaves are brought into the colony where they are used to feed underground fungus farms, which the leafcutter ants have quite the appetite for. Leafcutter ants and their cousins fungus ants (who grow their fungus on pretty much anything) have been observed transporting fungus specimens to new nesting sites, and in the event of an ant battle, enemy colonies are known to take the fungus of the losing colony as spoils of war. A more common site in a garden are ants ‘herding’ aphids and other sap-sucking insects together and protecting them from predators. The ants do this in order to have access to the sugary honeydew that their livestock produce as they feed. I would like to remind you that these insects possess a brain around 40,000 times smaller than ours, and while many of these feats are instinctually ingrained they are still no small task. While some species of ants are different colors, it can be hard to tell them apart. Many ants are most easily identified by microscopic features such as mandible size, tooth count, number of antennae segments, and so on. This is made even more difficult with the fact that ants from the same colony can take different appearances according to their job. Soldiers, for example, are beastly muscle-bound hulks while the general worker is much smaller. There are even differences in appearance between workers, with some species having as many as 3 different worker types alone. This helps them perform specific tasks very efficiently, however it can make identifying an ant species particularly difficult. There are several species that I will call out for being intrusive. The first is carpenter ants. These large ants don’t eat wood, but they burrow through soft, wet wood wherever available. If you see these ants in and around your house, check for any structural issues that might have led to their moving in. The imported fire ant, becoming more common in North Carolina, is another. Contact your local extension agent if you notice these on your property. There are native red ants as well, however, so make sure you get the right ant! One cool fact you didn’t mention are pretty much all ants are female; males are only bred when it’s time to mate. Thank you for all that you do, and I’m delighted to know a childhood classmate and friend who grew up to do conservation, sustainable agriculture work! Thanks for the fact! Also thank you for the link, it is very interesting. I would love to talk to you more about your studies, send an email to info@sprigglys.com if you ever get some free time and want to talk about ants. I hope that you are able to have your own garden, urban or otherwise, filled with ants and other creatures! PS: Hey Naim, this is Jill! Brannen, my husband, is the nature expert – I just love learning and promoting as much information as I can! Thank you so much for your kind words. I am so happy to have a childhood classmate that so appreciates what we are trying to do!